Instant Mustache is the name of an app that I'm going to develop. The idea is to show the development process of an app starting from a rough idea to a full featured app in the Android market. I'll demonstrate the process of developing the app as well as the thoughts and decisions involved. The source code will be publicly available on GitHub. Later versions of this series of articles are expected to be about topics like refactoring, adding features, testing and maybe monetization. I'll try to make everything as transparent as possible including user statistics of the Android market. Instant Mustache is a fun app that utilizes the face tracking feature of Android 4.x to add mustaches to all detected faces currently visible to the camera. Users will be able to take funny pictures and share them with their friends on social networks or other apps on their mobile phone. The user shouldn't need to place the mustaches herself. Instead the placing should be done automatically for every detected face. This is a rough idea every developer can come up with. In the following postings we will refine the idea, plan the app with some basic wireframes and develop an elementary version that can be extended to match our planned full-featured app later. Of course as a good entrepreneur we had this world-changing idea on the go and had only time to sketch it on a napkin to not forget it later. Great idea. Will follow. Hope I can learn something. I really like the basic idea for this series.Something like this is indeed missing. 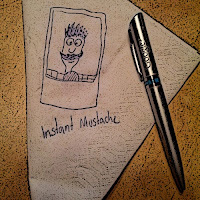 I'm not so sure though that this "Instant Moustache" idea will help in understanding how to monetize an app properly - but that was a "maybe" anyway.